Google is opposing a recommendation by the Australian Competition and Consumer Commission to introduce a mandatory takedown notice scheme. This could lead to automated censorship, the company warns. Various copyright holder groups don’t see the takedown notice proposal as a good solution either, but they are demanding even stricter measures. 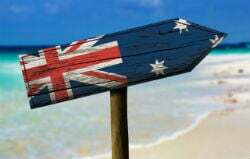 Last December the Australian Competition and Consumer Commission (ACCC) released a preliminary report on its Digital Platform Inquiry. One of the main recommendations it made was to create a mandatory standard for takedown notices to enable timely and effective removal of infringing content. To make sure that digital platforms indeed implement this standard, the Commission said that these companies could be subjected to a $250,000 fine for each contravention. “Making this mandatory code would ensure breaches could attract penalties under the Telecommunications Act,” ACCC wrote in its report. Following the release of the report, various stakeholders were asked for their input. Over the past several weeks, dozens of responses were filed and it’s clear that a mandatory standard is not widely embraced. Google, which operates a range of services that are subject to takedown notices, including its search engine and YouTube, warns that a new standard would be at odds with the well-established procedures in place around the world today. “A Mandatory Standard would represent a significant departure from the globally accepted standard for issuing take-down notices that is relied upon by digital platforms, online service providers and content creators around the world,” Google writes. The takedown procedures which are currently used in the UK, the EU, Canada, Japan, Singapore, and South Korea already require digital platforms to respond “expeditiously” to disable access to infringing content, according to Google. Creating more strict requirements with the added threat of possible ‘fines’ could lead to censorship and may stifle innovation, the company adds. “A more rigid standard with high fines for errors could incentivize automated censorship on an unacceptable scale and a curtailment of innovation and investment in alternative rights management approaches,” Google notes. The company further stresses that the comments from various copyright holder groups about the ineffectiveness of the current process are inaccurate. Google says that it presently takes a wide variety of measures to counter piracy, including automated removal of pirated content. Many of these points were also highlighted in Google’s most recent overview of how it fights piracy. For example, the company stresses that it prevents certain piracy-associated keywords from appearing as autocomplete suggestions. This is indeed true. Just last year Google added “Kodi” to its lists of banned words, which was quite a controversial move. However, according to some rightsholders, these autocomplete removals are far from perfect. Village Roadshow CEO Graham Burke, who’s one of the most vocal Google critics, highlights this in his company’s submission to the ACCC. Roadshow believes that companies such as Google should go much further in their anti-piracy efforts. 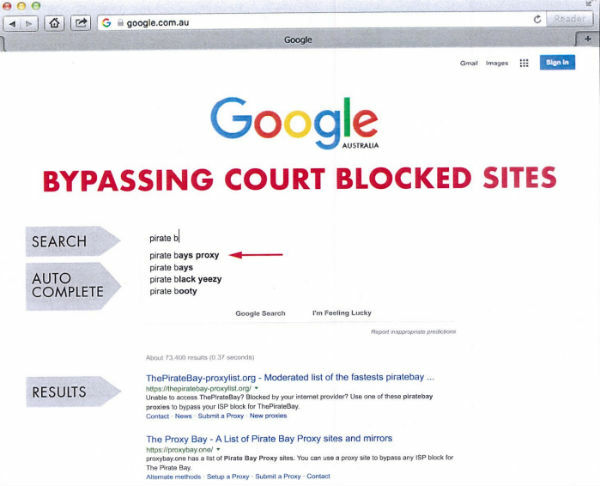 “For example, Google’s search results could easily remove links to websites blocked by Australian courts as well as clean up autocomplete which is a fast track, easy way to piracy,” Burke writes. Village Roadshow’s submission comes with various screenshots showing how autocomplete suggestions still link to problematic content. For example, while “Pirate Bay” is banned, Google now suggests “Pirate Bays” related searches as an alternative which can be used to bypass ISP blockades. Village Roadshow’s CEO hopes that the ACCC will come up with additional measures to ensure that infringing content is swiftly removed and to ensure that Google and other platforms take responsibility for keeping illegal content off their services. “The only winners in the current climate are pirates who are criminals because their business model is totally dependent on scamming and robbing people,” Burke writes. Google clearly disagrees and it’s not alone in its criticism of the automated takedown standard. Twitter also objects to the proposal and AFR reports that StartupAUS also signals various problems. “If adopted, [the mandatory standard] would result in a scheme that implemented a take-down mechanism without the accompanying safe harbour that provides the incentive with which to cooperate – essentially, it is all stick and no carrot,” the startups warn. Similarly, the Media, Entertainment and Arts Alliance (MEAA) believes that the proposal doesn’t go far enough either. “MEAA believes that much greater effort is required by digital platforms to act promptly in response to copyright owners’ requests to remove unauthorised content from their sites,” the group writes. Based on the wide variety of responses it’s clear that there isn’t unanimous support for the proposal from either side. A full overview of the responses is available on the ACCC’s website.